There is so much to digest. I drove through a lot of different terrain since last Friday that I sometimes can’t even remember where I was last or what it looked like. I don’t like to drive, stay one night and continue. I drove 900 miles in the last four and a half days, that’s too much when you are hauling a camper. The good thing is that I will make it to Gilroy in time for the garlic festival. A campground is secured and the ticket for the festival is purchased. Only 400 miles to go. 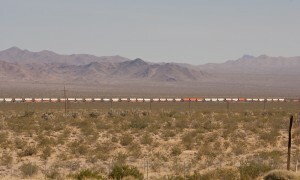 I have to tell you about yesterday’s drive from Kingman, Arizona to Barstow, California. It was amazing, fascinating and cool. I had a late and slow start leaving the motel in Kingman. I was very happy having spent the night with a little air conditioning. It was strange not to sleep in my camper which was parked right outside my door. I even plugged in the power cord from the camper through the window into the room. The fridge always seems to run better on electric versus gas. Never mind that it does not work that great in 100 degree temperatures, who does. 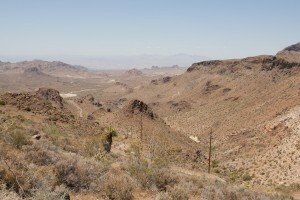 and continues through the Sitgreaves Pass, also referred to as Oatman highway. This is a drive up a narrow two lane mountain road with lots of curves and hairpin turns, never mind the steep slopes along the outer lane, my lane. This road was not build with big trucks in mind and the speed limit in many areas is 20 to 35 mph. Not that I could have gone much faster anyway. 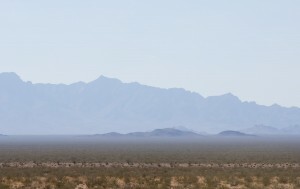 The early part of the road leads through the desert. Once on the mountain section the mountains change from what seems like big dirt piles to more rugged mountains with great rock formations. I had to think of the early drivers along this road with no air-condition (I didn’t turn mine on) and no means to keep drinking water cold. And I had to think of illeagals who walk through the desert for days to find a better home. The desert is not very forgiving and at 120F the air alone burns your skin. It feels like when you open the oven door and that hot blast of air hits your face. I was very happy that I opted for this winding road and didn’t continue on the interstate. This way I could pull over, take pictures and truly enjoy my surroundings. I ran into a biker, actually he was a motorcyclist wearing all the protective gear one should wear when one rides a bike. He had been riding for the last ten days from Florida. We exchanged road stories, we had driven along the same routes. I continued running into him along the way since we both stopped and took photos. 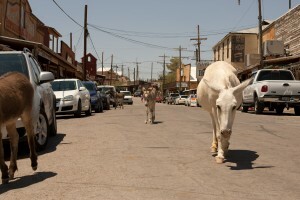 After 30 miles and two hours later, OK I did stop frequently to take pictures, I landed in Oatman and that is where I ran into a handful of jackasses, the four legged kind. They are supposedly wild burros. Ancestors of the burros used during the mining days. They roam the street (there is only one) and stick their heads into stores. Oatman is considered a ghost town by many, however there are plenty of souvenir stores and restaurants to make you think differently. I continued my drive south of town towards Needles, California. More hot, hot desert. I think this might have been the more interesting stretch of Route 66, nothing better than an adventures desert drive, where you never know what lies behind the next turn. 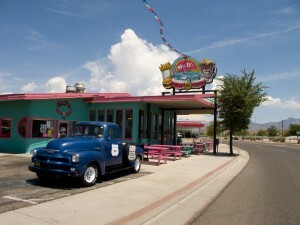 I had run into Route 66 in New Mexico, in Tucumcari and Santa Rosa. Both towns had more closed down businesses and gas stations than any small town I have come across so far. Most of the old motels were only a shadow of their old selves. It is sad to see so much deterioration. 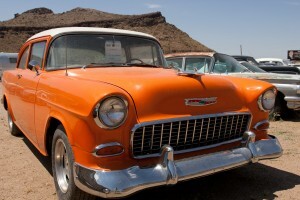 Everybody marvelous about Route 66 and there are still plenty of places that make money of it, but there doesn’t seem to be enough money to restore or simply to tear down the remains. Back to yesterday’s drive. By the time I reached Needles I was hot. I know I could turn on the AC, but a) I don’t like it and b) I am stubborn. So 100 F is no big deal until I come to a stop and really feel the heat. 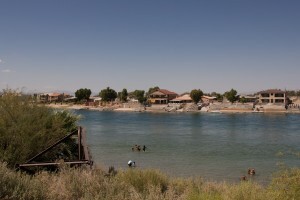 When I crossed the Colorado River I saw some people swimming. Should I pull over and go for a swim? Nah, let’s keep on moving. After the next turn I see a family in swim wear walking down the street. OK, let’s ask them if I can just jump in anywhere along the river. Yes, anywhere is just fine. They pointed me in the direction of a parking area and all I had to do was put on my swimsuit. I just love when I have everything handy. Wow, the river was freezing cold, but it felt sooooooooooo good. I talked a little with the grandmother of the group and the kids showed me their swim trick. Thirty minutes later off I went again. All cooled down. Given the current temperature I was not interested in sleeping in my camper. I made reservations at the Barstow Motel 6. I still had a three hour drive ahead of me. And what a drive it was. Interstate 40 was not as bad traffic wise as I had feared and it went through beautiful mountain ranges and the Mojave Desert Preserve. Coming from Texas and New Mexico I had seen different kind of mountains. 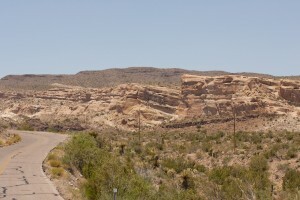 Texas’ mountains look more like big hills with rounded tops, further north in Texas the hills have flat tops when they run along a canyon. In New Mexico the mountains have pointy tops. These mountains had great jagged edges. The mountain ranges ran perpendicular to the highway and in one area the big ranges were preceded by a handful of little mountains. The bases of these mountains were engulfed by this blue late afternoon light / mist which made it look as if these mountains were floating in midair, almost mystical. Look for it the next time you drive west on I-40 just about 20 miles west of Needles. And then there was the great big freight train. I just love them, 100 container cars at a time. And yes, I had to wait at a crossing and let them all pass. I have also slept right next to tracks and cursed the drivers when they enjoy pulling the whistle late at night to make sure that everybody knows that they are working and I still love them. The drive took longer than I had hoped. There were many long inclines where I could only get my speed up to 35 mph and then there were the head winds. Good thing this was a two lane highway otherwise some people might have gotten a little impatient. Did I mention the road condition, potholes all along the right lane, bad I really had to focus on the road, no left and right sightseeing. The night at the motel was too cold, despite the fact that I had turned off the AC. It was time to sleep in my bed again. I drove to a nearby campground in Boron, I know you all have heard of this town (wink, wink) the camper temperatures have dropped to comfortable sleeping conditions, 85 F. I am very happy to be “back home”. One last thing. California is expensive, gas is at $3.29 per gallon. I even saw $3.59 and many stations charge an extra ten to twenty cents for credit card use. My high end price elsewhere had been $2.79. Also campground fees are twice as high as what I have been paying; $40 per night is common. Arizona’s camping fees were just as bad. Thanks for reading this far. I know I have some very regular readers and I know most of them. However, there is someone in the Pasadena area who has been following my blog almost from the start and I don’t know who that person is. Would you mind leaving a comment? Thanks! Thanks Kev. Nantucket should be a refreshing change after all the heat you had in the city. Coastal California is freezing, mid 50s. You have quite the talent for keeping us all connected and just waiting on the next installment, . . . .